While peaches are Colorado’s favorite famous fruit crop –and a few are still left — we sometimes come across a gorgeous slew of apples, too. Apple orchards are just south and west of Colorado Spring and Labor Day has often found us taking a day trip to pick a bushel or at least a few baskets. Come fall, I make crostatas regularly. They’re beautiful, terribly good to eat, and generally make folks quite happy. A free-form fruit pie (often made with homemade jam in Italy), they’re easier to make than traditional American pie and are show-stoppers when you have friends to dinner. I’ve blogged the crostatas before, and have taught them several times for the Italian classes I’ve done at home. 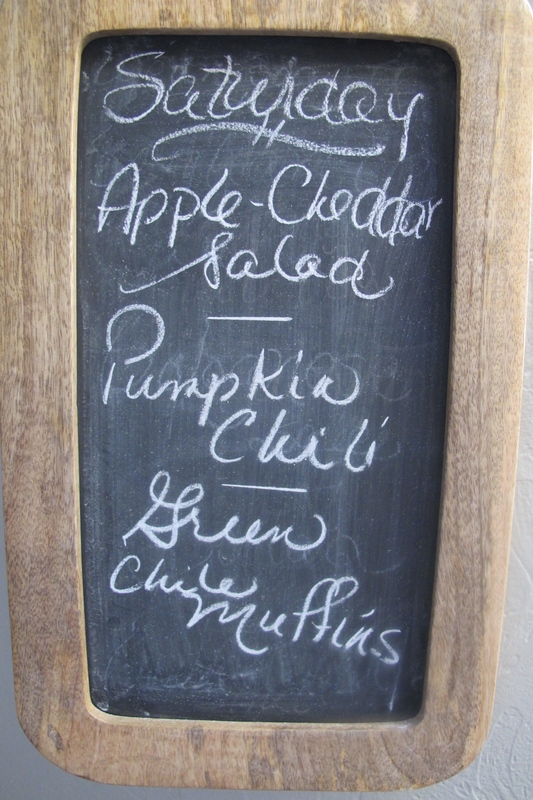 But I didn’t think of them in terms of citrus until our Power Foods list came up this week. 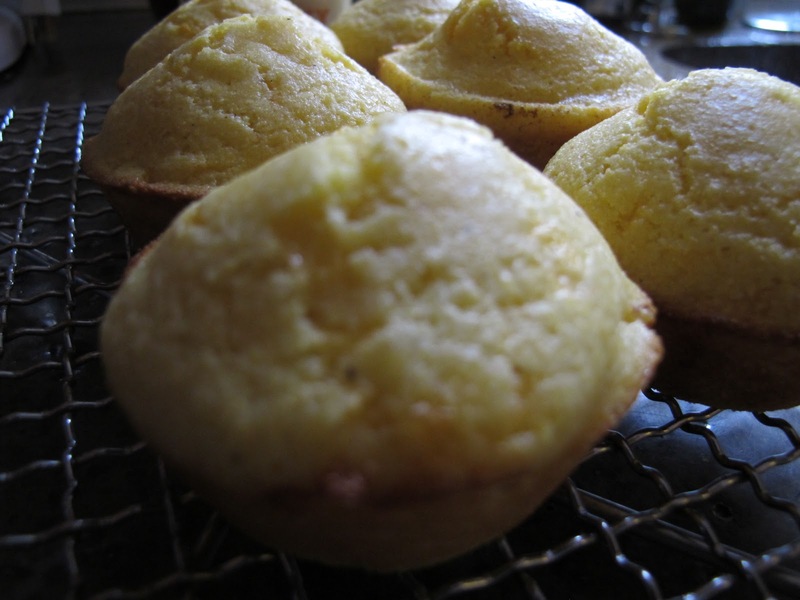 While citrus (lemon particularly) is a huge part of my cooking, I think about it less in terms of baking. 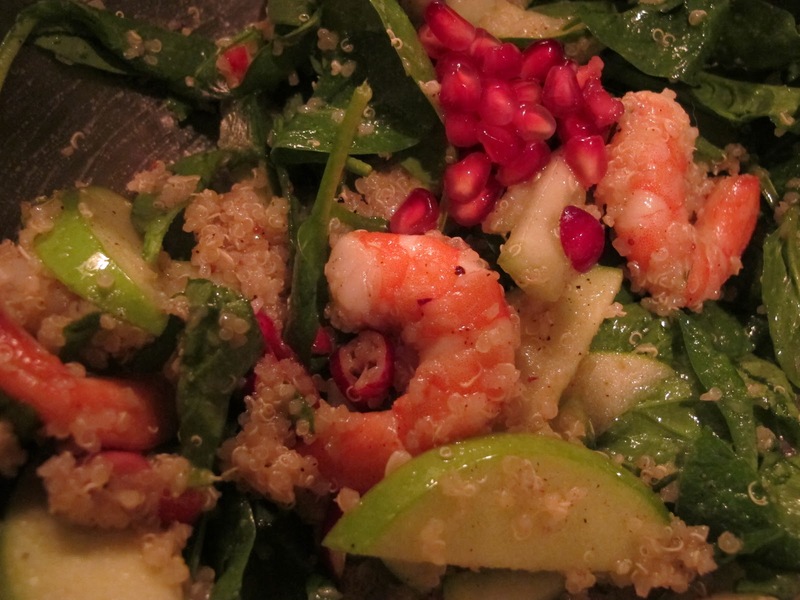 For instance: I rarely make a green salad without squeezing a lemon over it. Either I have lemon and oil, lemon alone, or lemon before a vinaigrette. Whatever choice I make, lemon, as an acid, is always followed by salt and pepper on my salads because salt dissolves best in acid. For that reason, if I’m making a vinaigrette, I always put the salt in the acid — whether citrus or vinegar– before adding the oil. Secondly, there’s little to perk up a piece of chicken, a steak, or a lamb chop like a squeeze of fresh lemon. Of course you like lemon on fish, right? Why not red meat or poultry? Another thing: I love lemon juice in chili. 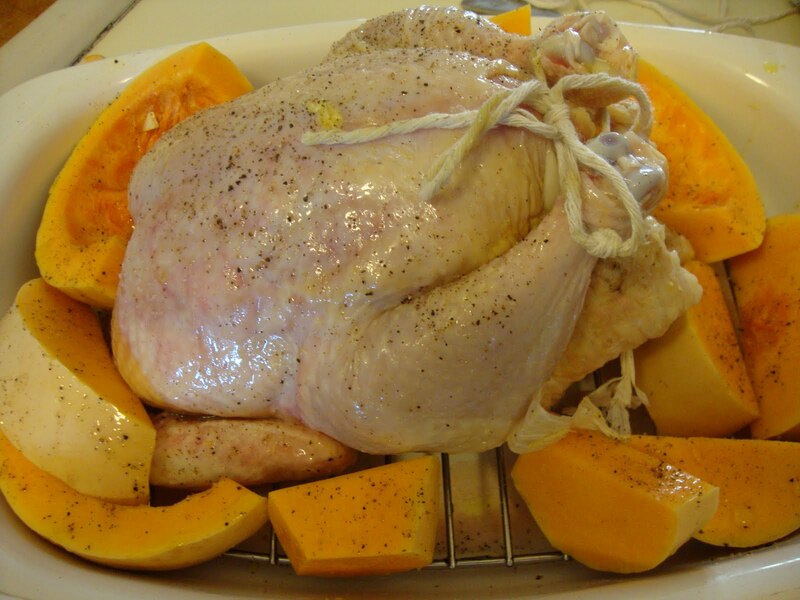 I stuff my roasting chicken with big pieces of orange and a cut-up onion or sometimes roast a lemon in the bottom of the pan for the sauce. I use one citrus or another to keep my cut fruit from browning. There are so many ways I use citrus, I can’t count or write them. I buy lemons by the bagful, but rarely go to the store without also buying limes. Because I don’t eat oranges or grapefruit for breakfast, I buy those only when I’m cooking or baking with them. These fresh fruit fall crostatas, too, would be very much less without the citrus. 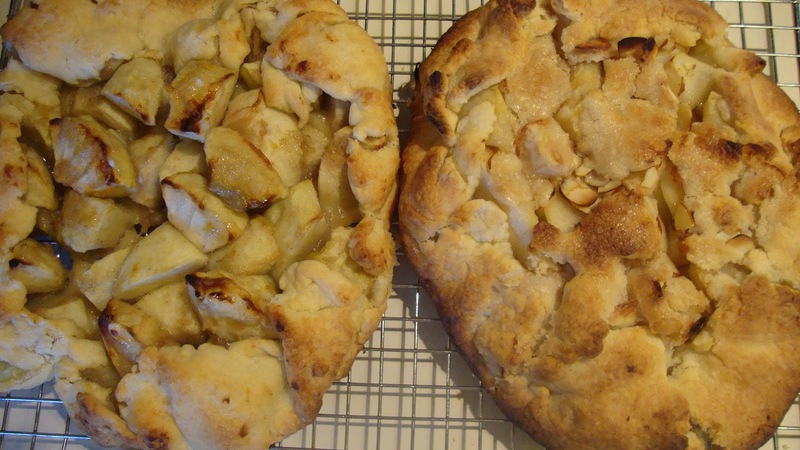 I make several kinds of crostatas, but these two, apple and pear, have orange and lemon zest respectively. You could switch them out and use orange with the pear and lemon with the apple; I’m sure it would be lovely. Citrus is, of course, loaded with vitamin C, provides fiber, folate, lycopene, potassium and other vitamins and minerals. (More below.) 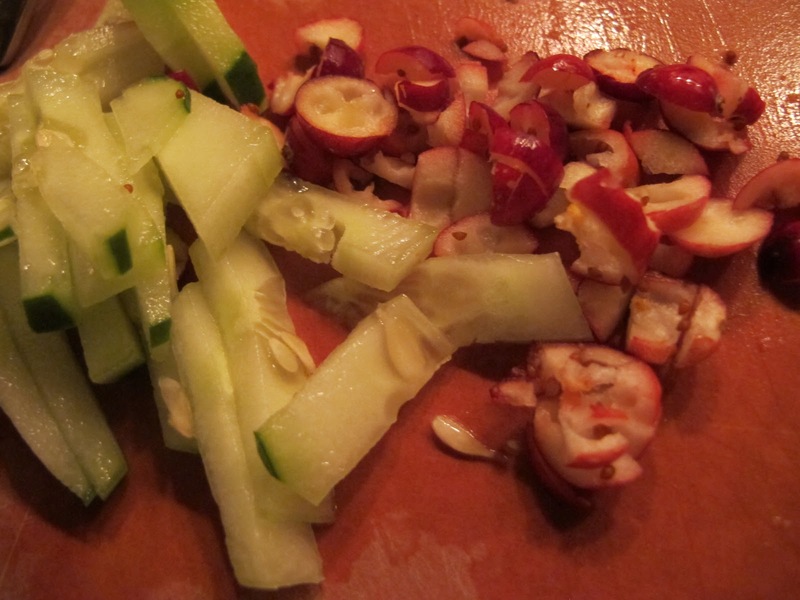 Yes, it’s great food… But for me…it’s all about the flavor when I use it for cooking. 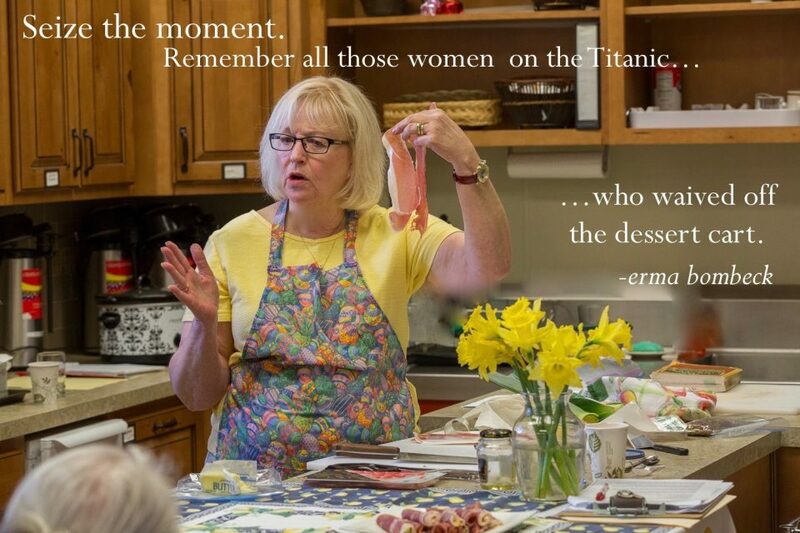 A picture story…followed by the recipe. Bake peace! Baked pear crostata close-up; I liked the pear best. The pastry recipe for this comes from Ina Garten, who, I am pretty sure got it from Joanne Killeen and George Germon in CUCINA SIMPATICA; ROBUST TRATTORIA COOKING and maybe a few other places! Just a little detective work of mine. Despite the provenance, it’s a tasty tidbit for fall when the fall fruit is divine As neither one of them made pear, I feel I’ve contributed to the development of the recipe and hopefully to the happiness of your tummies. This is tres easy, and if you’re afraid of pastry, this is a great start. There’s no form-fitting into pie pans or making a crust look “P” for perfect. 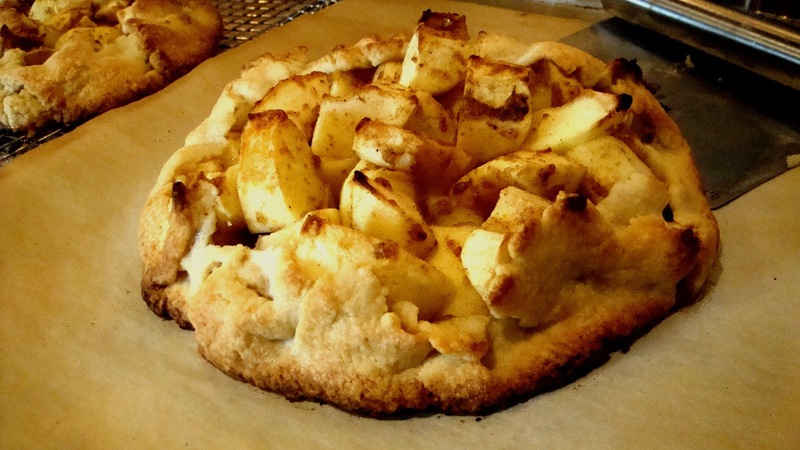 This is a free-form, rustic pie baked on parchment paper on a baking sheet. 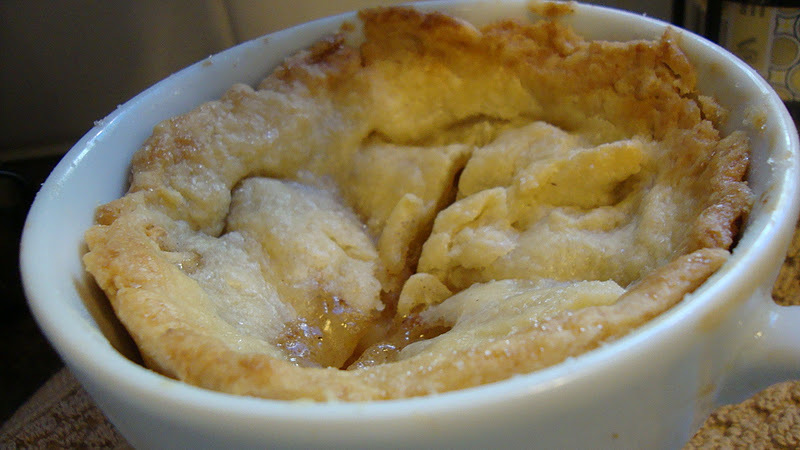 If it spills over or runs through, it’s just crusty-gooey and even better. Don’t hesitate. Pretty for Thanksgiving, too. Oh, in France, this is a galette. In the food processor, fitted with the knife blade, pulse together the flour, sugar and salt. Add the cold butter and pulse until mixture is the size of peas. Slowly add iced water through the feed tube until dough begins to come together. Remove carefully from processor and divide in half. Press each into a disc. Wrap one in foil and freeze it. Refrigerate the other for an hour is best, but you can roll it right away if you must. Dust the counter very well indeed with flour and roll the disc, using a rolling pin, into an 11″ circle. 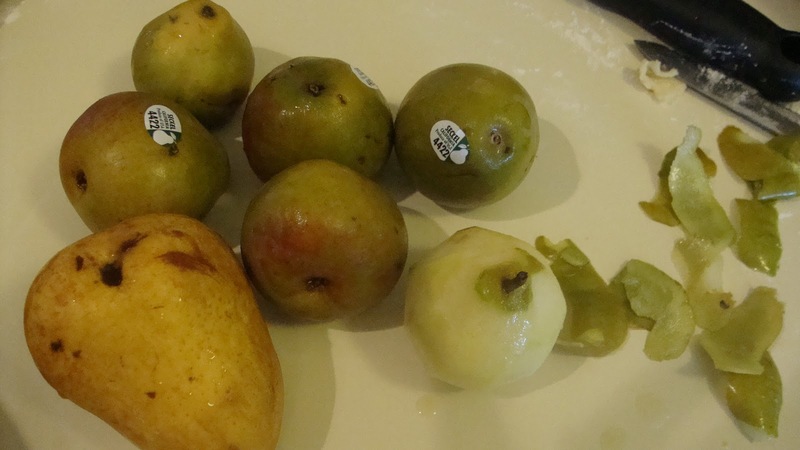 Place on parchment lined baking sheet until you have the fruit ready. 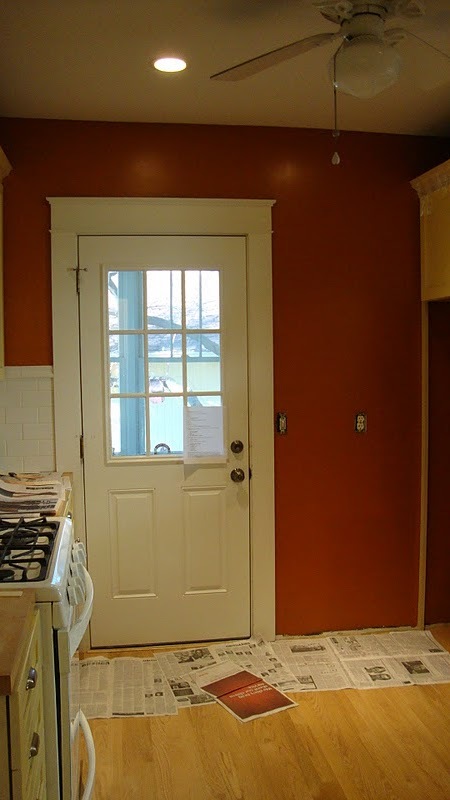 (Check out the pics above where I give you two options for getting the pastry from the counter to the pans.) 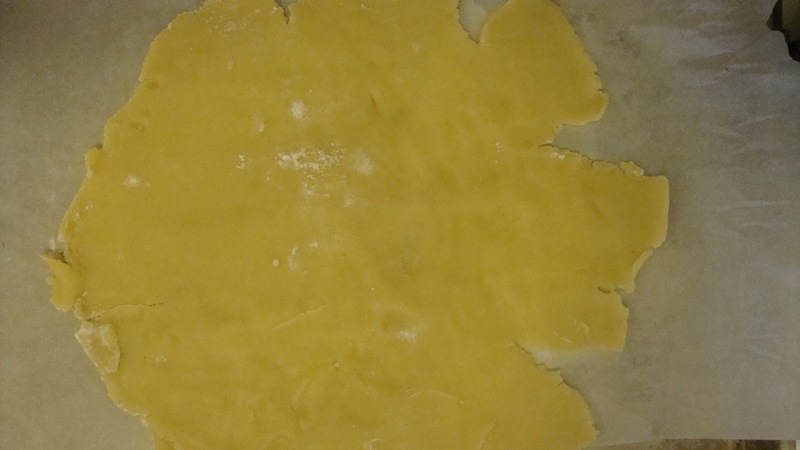 You can a. fold it up gently and quick like a bunny pick it up, and centering it over the baking sheet, place it carefully down and unfold it or, b. loosely roll the dough back onto the rolling pin and move the rolling pin over above the baking sheet, lowering it and loosening the pastry down flat onto the pan. This is not easy to describe; I apologize for lack of prowess as a technical writer! In a large bowl, mix cut-up pears with lemon rind and most of the almonds, reserving 1T or so for the top of the crostata. In the food processor, make a crumb topping for the crostata by pulsing together the flour, sugar, salt, cinnamon and butter until crumbly. Remove the blade from the processor bowl, and, using fingers, pinch together the crumbs until they hold together. Place baking sheet in oven and bake 25-30 minutes (use the longer time above 5,000 feet) until golden brown and crispy. Remove from oven and let sit for 5 minutes before sliding pie off the paper onto wire rack to cool completely. Will hold at room temperature a day or so and in the refrigerator for several days, though it is best fresh. 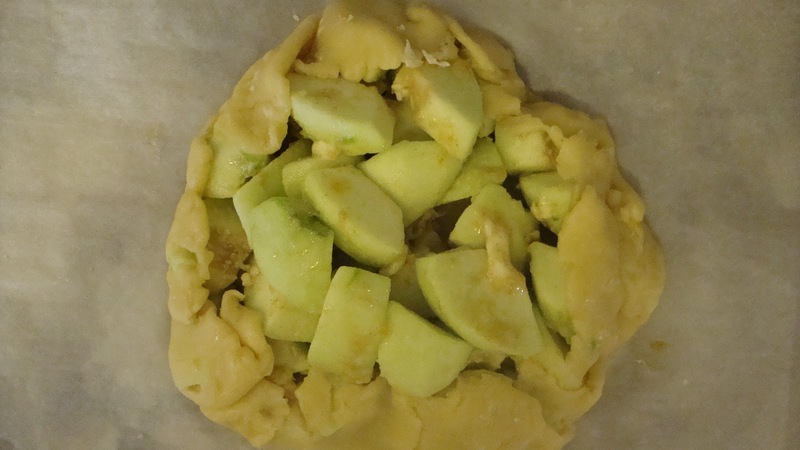 Note: If you’d like to make an apple crostata with the other crust, it’s made almost like the above pie, but you’ll need 1 1/2 # (3-4 large Granny Smith) apples, 1 t orange peel and no nuts unless you choose to add some one your own. If you do, toasted walnuts might be best. This is Ina’s method! More info on citrus nutrition HERE. 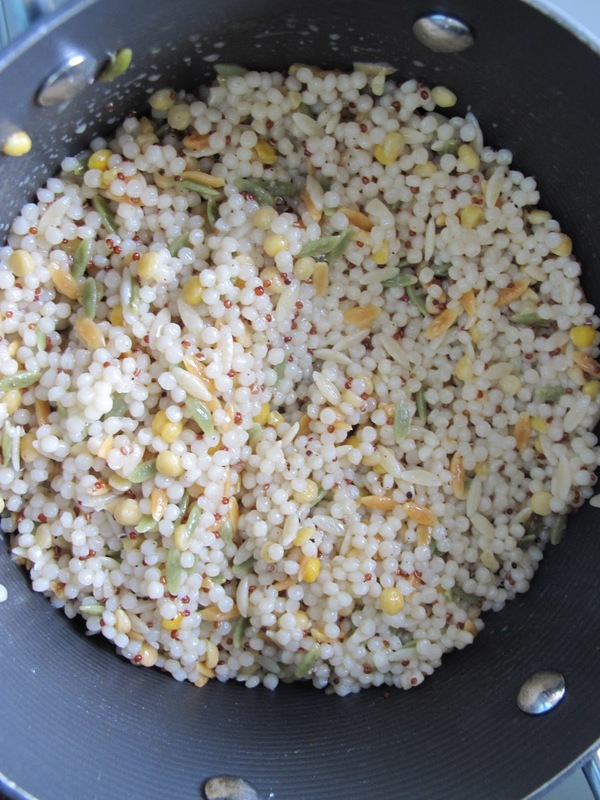 I’ve had some Israeli couscous (actually a blend) in my cabinet for a few months. Waiting. 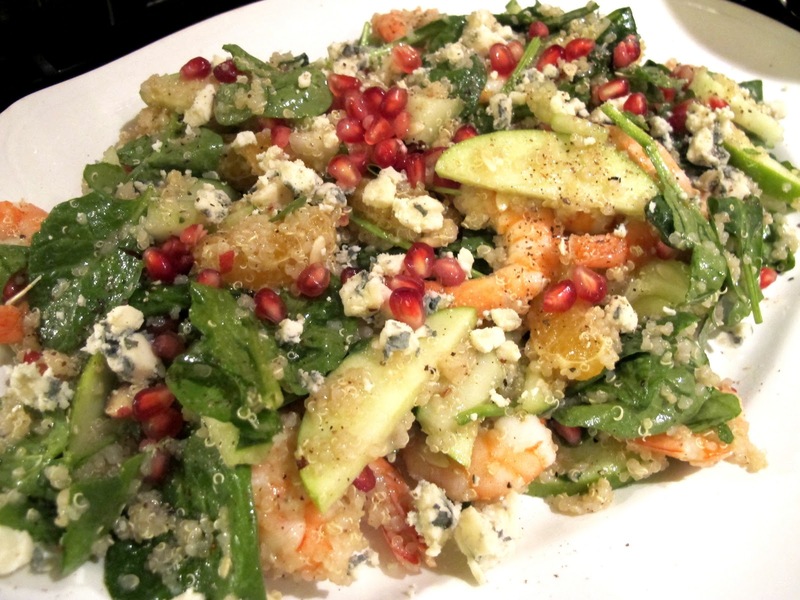 Typically I throw some leeks, garlic, and asparagus in a sauté pan come spring and throw those lovely things into a bowl of couscous or orzo with a handful of grated Parmesan and lots of black pepper. When I realized this was the week to blog winter squash, a different group of ingredients started to percolate. Despite the summer tomatoes still coming on (albeit slowly) and the basil crying for that last bowl of pesto to be made, I kept thinking fall food once the squash got in my head. 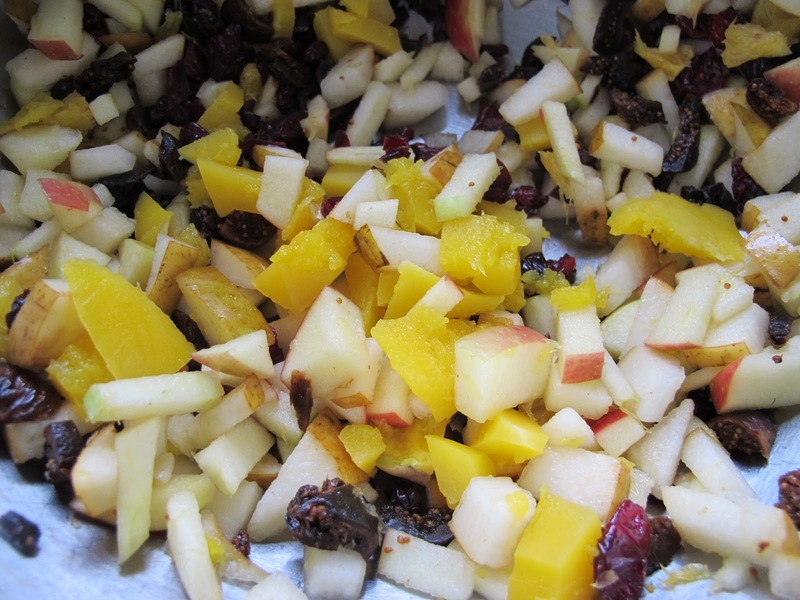 Cranberries, apples, pears, sharp cheese, nuts. 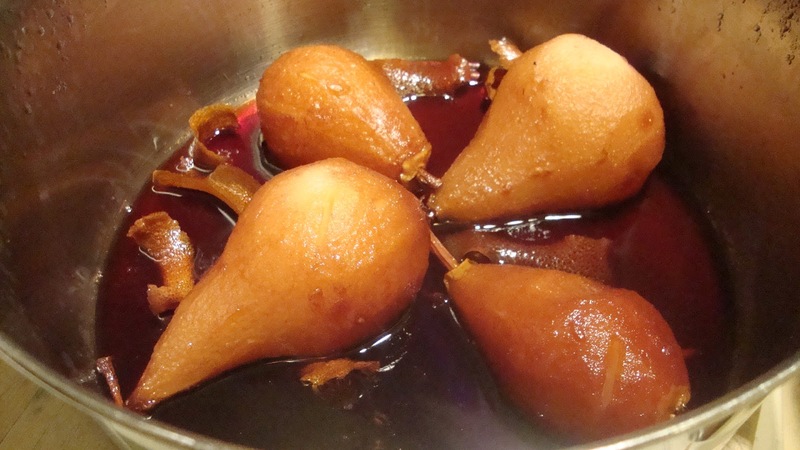 Fall..I adore pears…here I’ve just poached them slowly in port with some orange peel and cinnamon sticks. Thursday I had a big pot of turkey chili on the stove and called some friends to run over and help eat it. 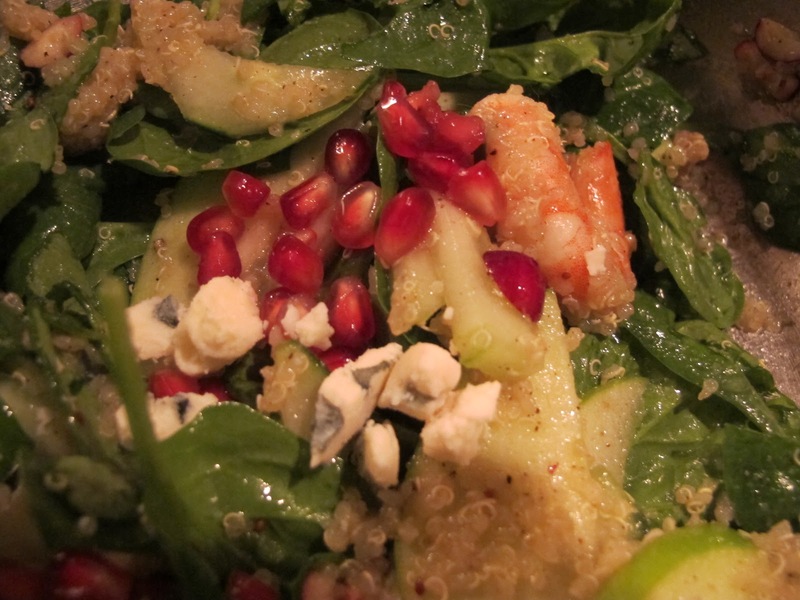 This salad, which began in my head days before it ended up in our stomachs, started the meal. 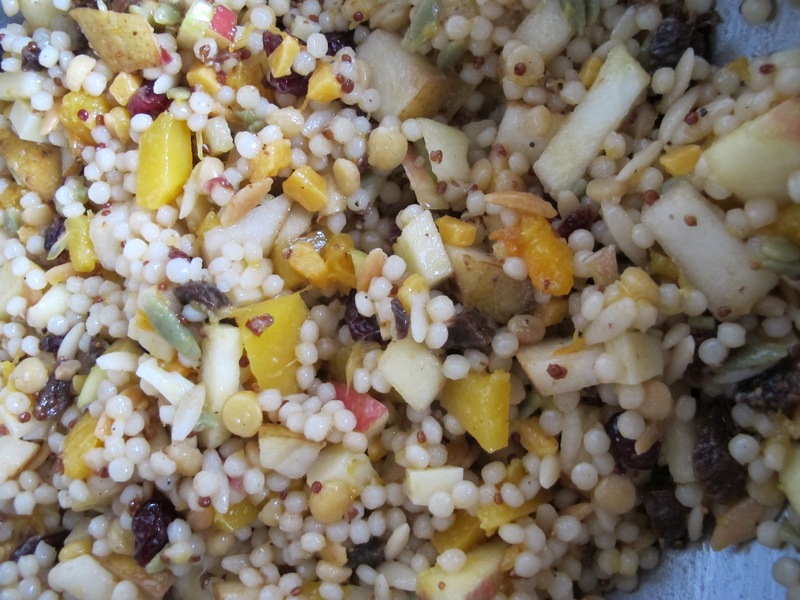 I cooked the couscous and started chopping fruit and toasting nuts. It came together that easily; it’s fairly fast, too. I did think I might have liked walnut oil for the vinaigrette, but the only can I had was in the frig at our Colorado house where it’ll stay a bit fresher over the time we’re not there. Cook 8 ounces of Israeli Couscous* according to package directions. Use chicken broth in place of water. You can add a few leaves of fresh sage if you have them (remove before making salad). 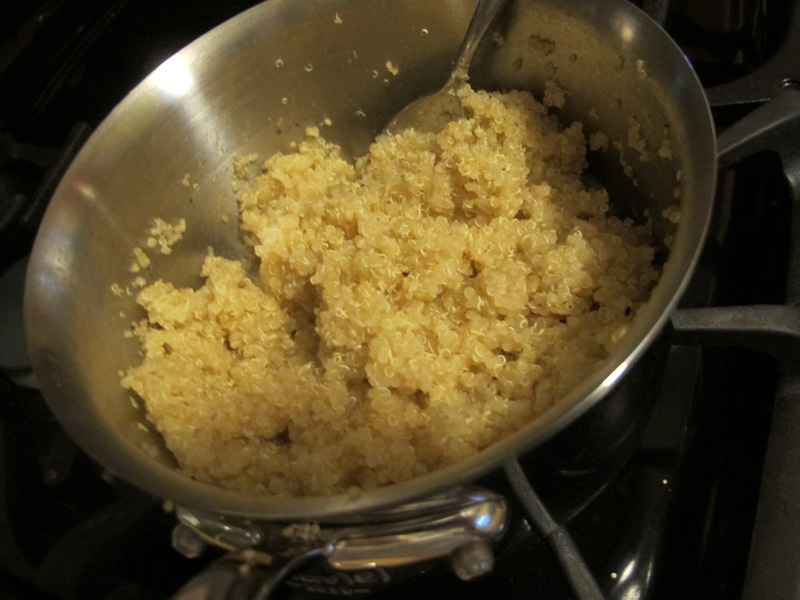 When couscous is tender, add 1 1/2 tablespoons canola oil and 1 1/2 tablespoons olive oil while still hot. Sprinkle with 1/4 teaspoon each kosher salt and fresh ground white pepper. Optional: Stir in 1/4 teaspoon crushed red pepper. Cool to room temperature. 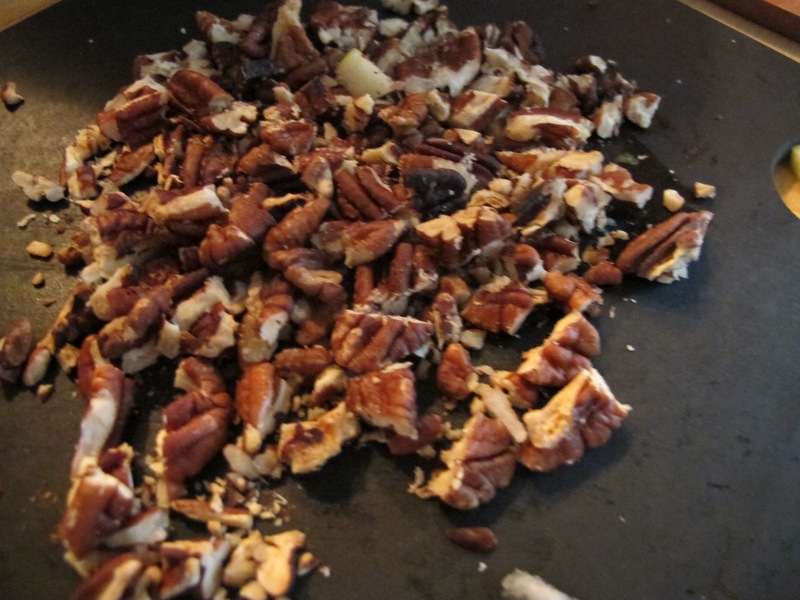 Toast 1/4 cup pecans in a dry small skillet and chop, reserving a few whole nuts for garnish. Dice (medium) 1 pear, 1 apple, 1 orange (peeled), 6 dried figs (or fresh), 1 small cooked butternut squash (see below for my microwave directions). Dice (small): 2 oz. each sharp cheddar and Swiss cheese like Jarlsberg or Emmental or even Gruyere. 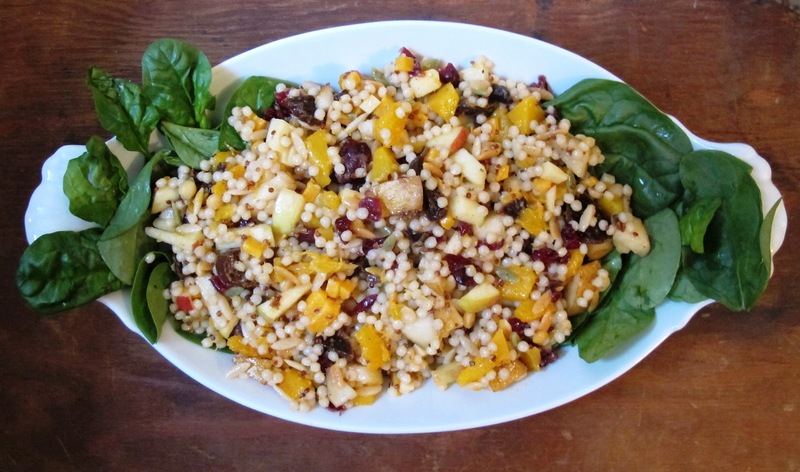 Mix fruit, squash, cheese, 1/4 cup dried cranberries, and pecans with cooled couscous. 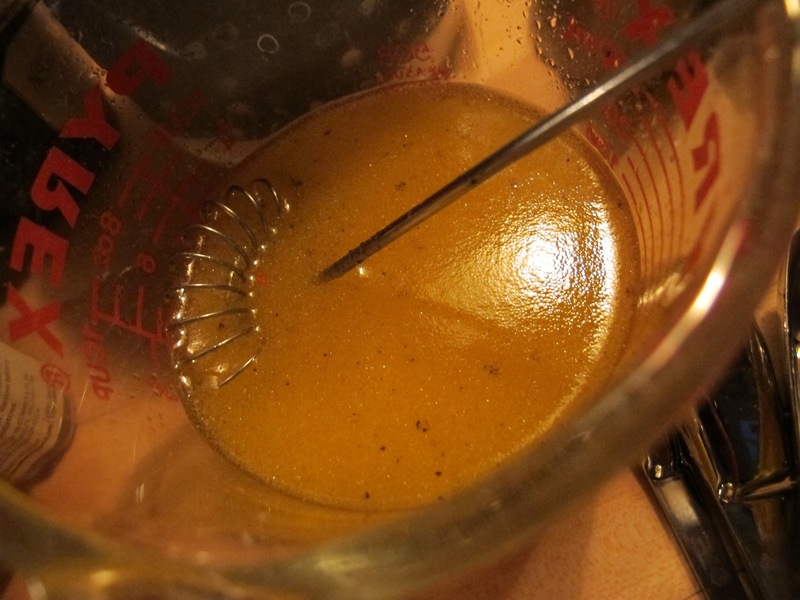 Add the juice of another orange and 1 teaspoon honey. Stir well, taste and adjust seasonings and/or dressing. 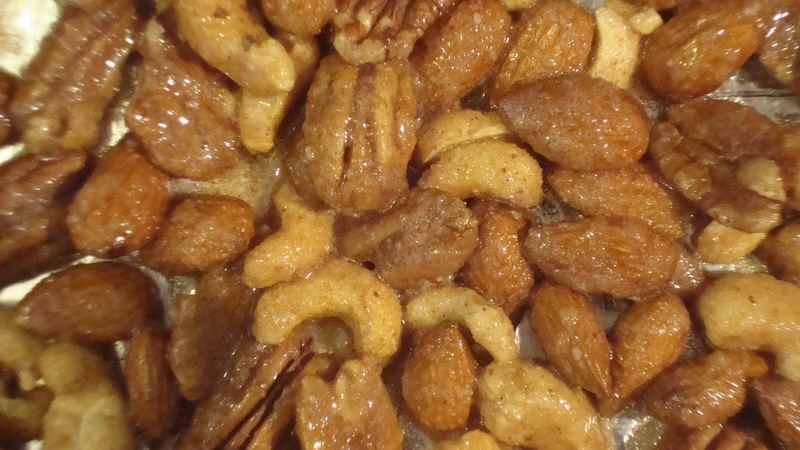 Serve in a bowl lined with fresh spinach leaves and garnish with reserved whole pecans. 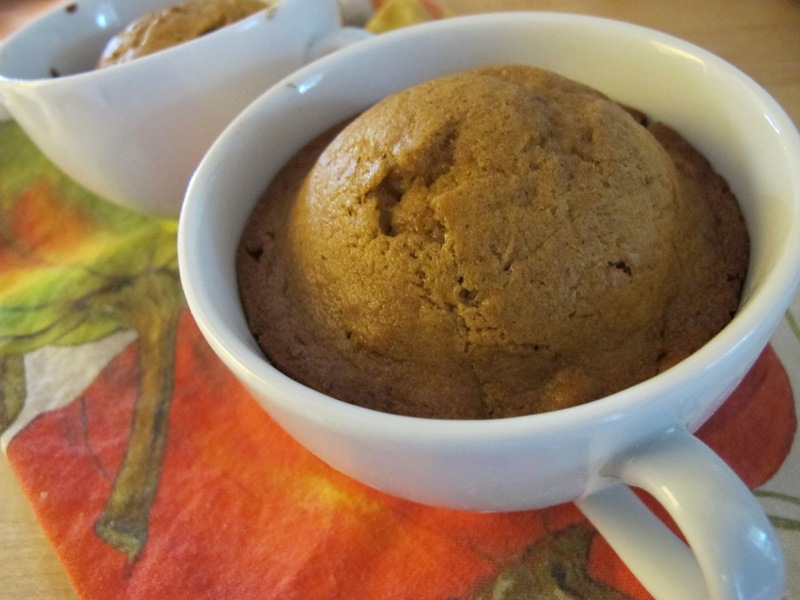 We liked this salad with coffee cup pumpkin-chocolate chip muffins. 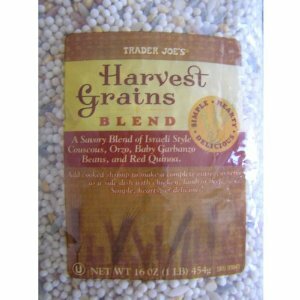 *I used Harvest Grains Blend from Trader Joe’s (available on amazon.com as well), which is a “savory blend of Israeli Couscous, Orzo, Baby Garbanzo beans, and Red Quinoa.” Regular Israeli or pearl couscous is fine and orzo or even farro would be easily workable substitutes. Place squash in a large microwave-safe dish and, using a sharp thin knife, poke a few holes in the largest section for escaping steam. Microwave on high 3-5 minutes (depending on size of the squash–a 1.5lb squash might take 5 minutes, for example) and remove the squash to a cutting board. Using a large chef’s knife, carefully cut the squash in half horizontally and with a large spoon, scoop out seeds and strings. Place the two halves back in the baking dish with a little (2 tablespoons or so) water and put the dish back in the microwave. Cook another five minutes on high or so (depending on the size of the squash) until tender. Covering the squash with plastic wrap or a microwave-safe cover will decrease the cooking time. I have also filled the center section with butter and a little brown sugar and served it just like that. (I often do this with acorn squash for a quick hot lunch.) Otherwise, you can let the squash cool, and then peel and chop or mash it according to your needs. This is much easier than peeling (or cutting) raw butternut squash, which is, at best, difficult. 1. It’s delicious; it’s good for your body. 2. It’s easy to prepare in several ways: Stick in oven, saute, braise, boil, or microwave. 4. It’s an excellent addition to soups and stews. 5. 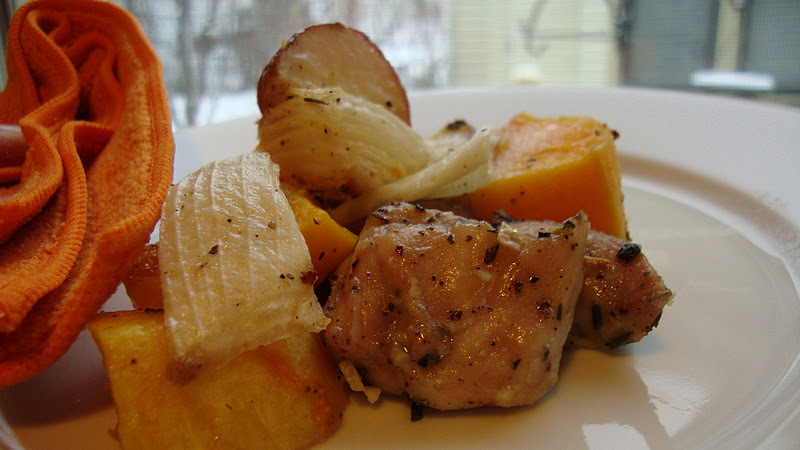 It’s a good substitute for potatoes with pot roast or roasted chicken. 6. 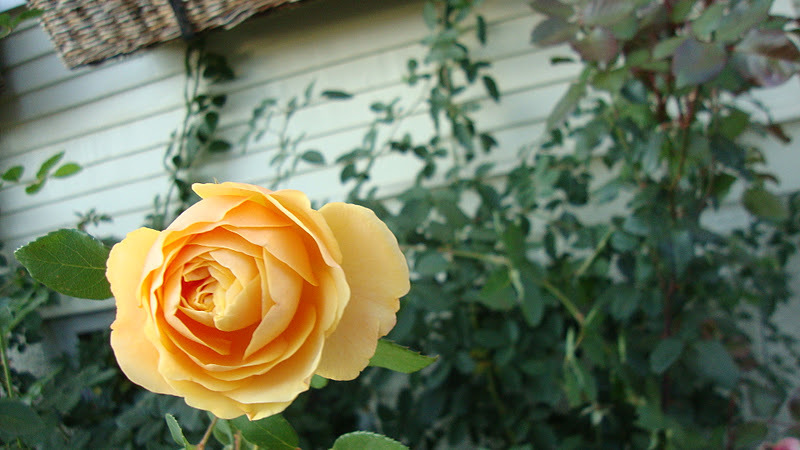 It’s inexpensive and easy to find nearly year round, but particularly now. Be brave and try whatever beautiful squash you find at the market. Whatever you do with acorn squash, you can easily do with most of the others. Even spaghetti squash is quickly cooked in the microwave. Shred it with a fork, add a little butter (salt/pepper) and you have a beautiful meal. And, yes, you can add marinara and stay on South Beach, phase 2!! Don’t want to deal with the peel? You can buy peeled and cubed butternut squash or pumpkin at some markets, but you will pay a premium price. 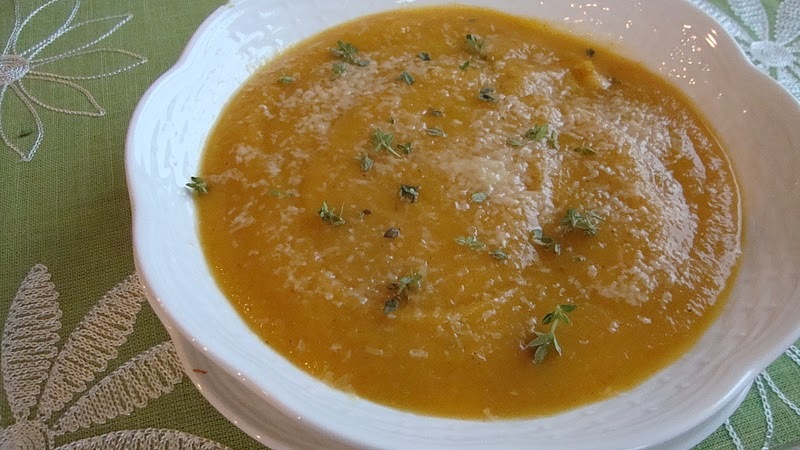 Each cup of cubed butternut squash provides approximately 60 calories, 16 g of carbohydrates and 3 g of fiber. It also supplies almost 300 percent of your daily value of vitamin A, 50 percent of vitamin C, 7 percent of calcium and 5 percent of iron. 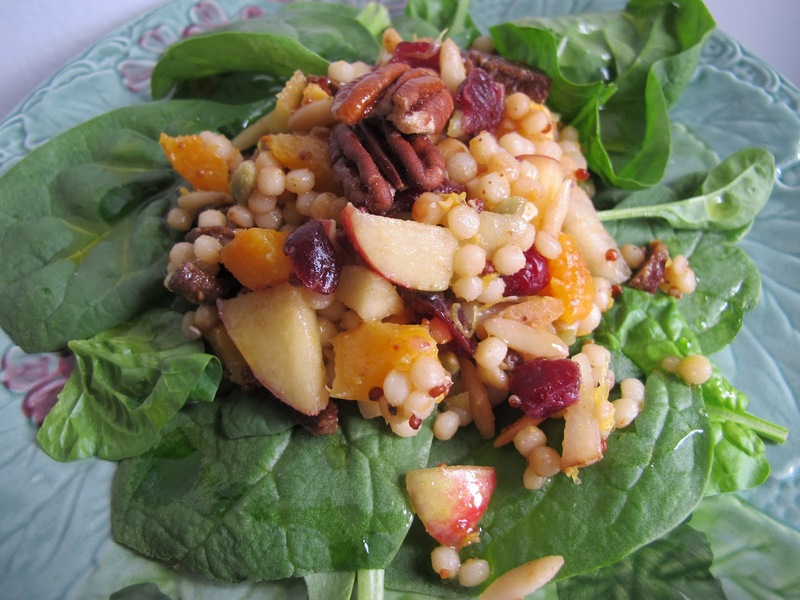 Want more info on winter squash, including nutrition and recipes? Visit the Snap-Ed (USDA) site here. 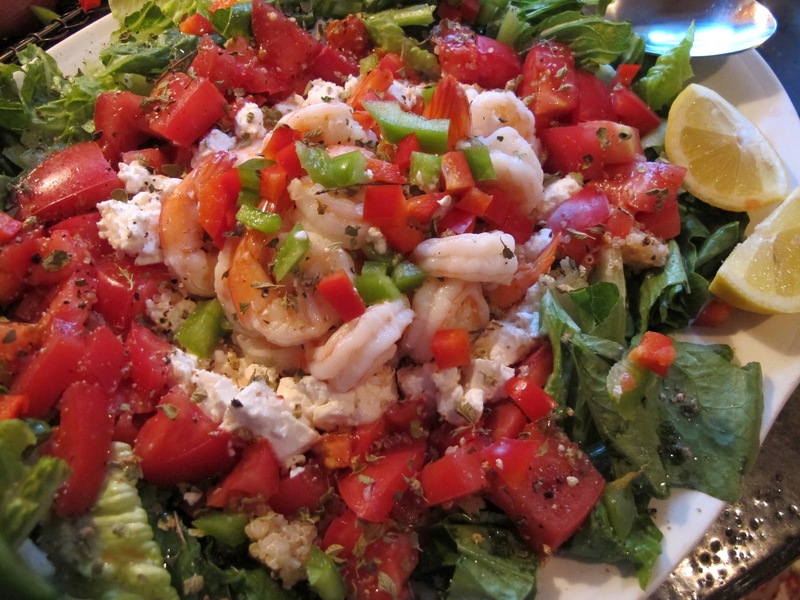 If you liked this, you might also like this recipe from my Dinner Place blog. Throw it all together with olive oil; slip it into the oven on a big rimmed baking sheet. Dinner emerges in about 35 minutes! This is a lovely soup for someone who is not well or can’t chew, but is luscious as well for a first course at Thanksiving. My hairdresser works about a half-a-block from my house. Her name is Kathy. I chose her because… she works about a half-a-block from my house. 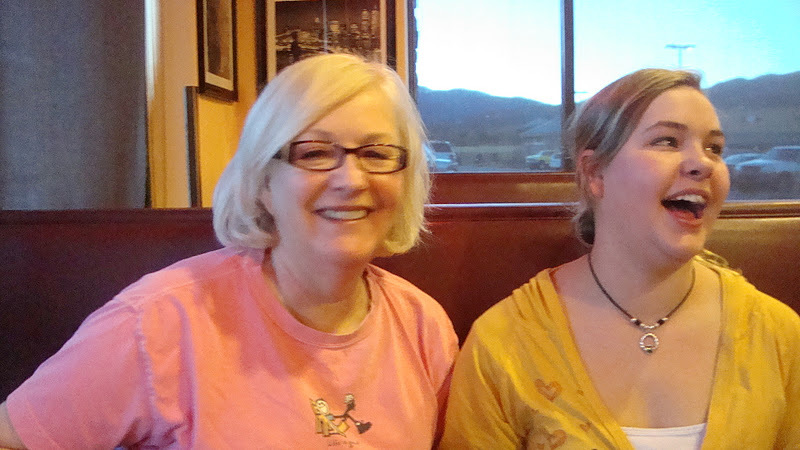 When we moved here, I cried at leaving Jen, my hairdresser of 13 years in Colorado. So I didn’t even look for anyone special; I just chose the closest “girl” and tried her. I mean, you’ve seen my hair. What could go wrong? And, if it did, how much time would it take to grow a bit? Luckily, everything has worked out fine. My hair’s just right. When Kathy did it the first time, I sent Jen a pic on my cell phone. “She’s got the color spot-on, but it’s a wee bit short,” said Jen. Kathy and I hit it off right away. 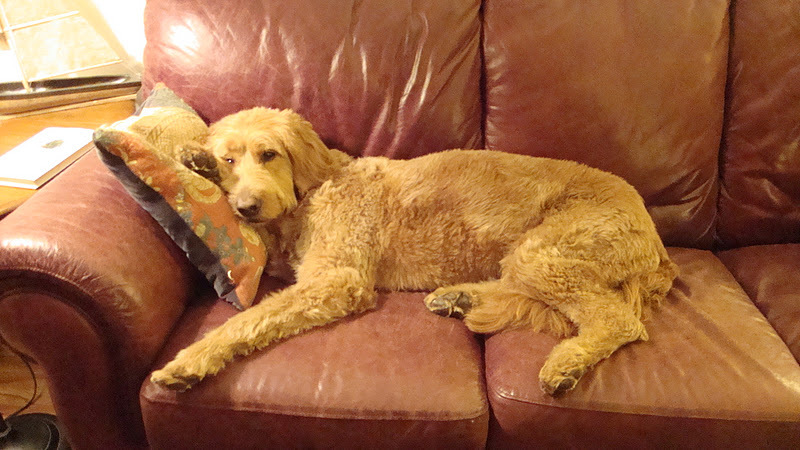 We’re both “of an age,” though she still has a couple of kids running around sometimes at home. She also has lots of dogs–more than I do. There’s tons of great stuff about her, but I like her because you can just talk about anything when you’re in her chair: houses, food, kids, husbands, church, jobs, horses, dogs, clothes, shopping, shoes, ETC. She’s given me the info on great places to find and do all kinds of things, but mostly helped solidify my forever dedication to the lovely institution of the St. Paul Farmer’s Market where her family has a bagel breakfast sandwich and coffee stall. (Dave and I frequent that hot spot.) Sometimes we talk about whether or not it’s worth it for them to start baking their own bagels. Having watched Dave make bagels (I don’t make them! ), I lean toward buying them from the great bagel maker down the street–just like they have been. Why mess with a good thing if you’re still making a tidy profit? Late this morning, I started Kathy’s pie. I had no idea how her mother made pie, but my pie wouldn’t be like Kathy’s mom’s no matter what, so I just baked the pie. Pretty much like I always do, but with a little bit of a twist all around. 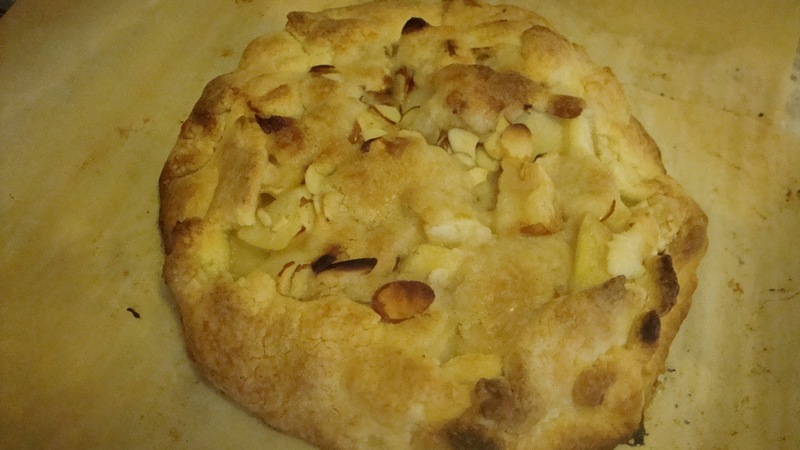 Lots of butter, great Honeycrisp apples, Penzey’s cinnamon right on top of the unbaked bottom crust. Cream brushed top crust. A recipe I’ll share. You might like it for Thanksgiving. If you make it now and don’t bake it, you can wrap it tightly in foil, freeze it, and bake it frozen (on a foiled sheet pan) early Thanksgiving morning. It’ll take longer to get done, but done ahead is done ahead. 2. 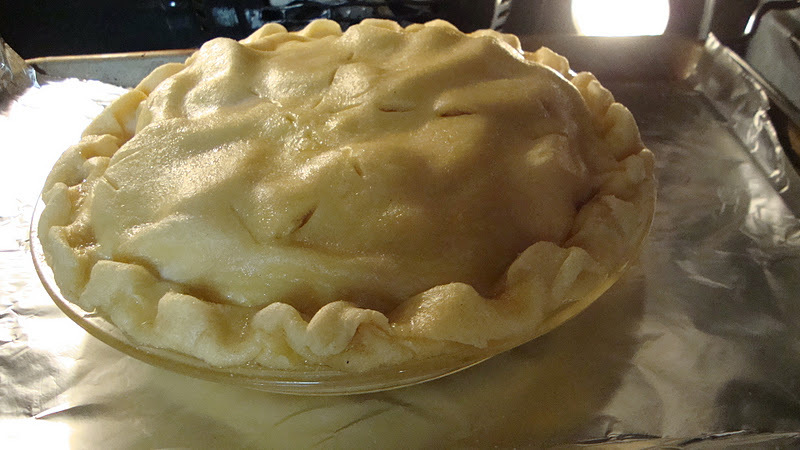 Place one pie crust in the 9″ glass pie pan, trim, and crimp (pinch) edges. 3. Use about 1 tsp of the sugar and mix with 1/8 tsp cinnamon. Dust the entire bottom crust with the cinnamon-sugar mixture. 4. 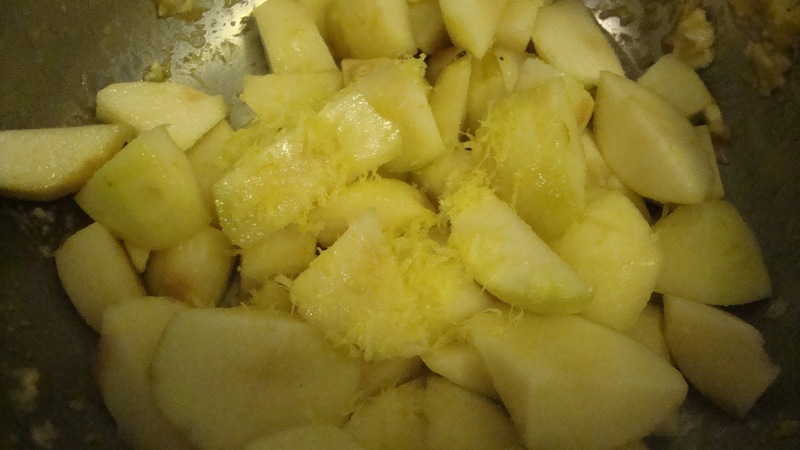 In a large bowl, mix apples and lemon juice. Add flour, 3/4 cup of sugar, the rest of the cinnamon, the nutmeg and the salt. Toss gently, but well. 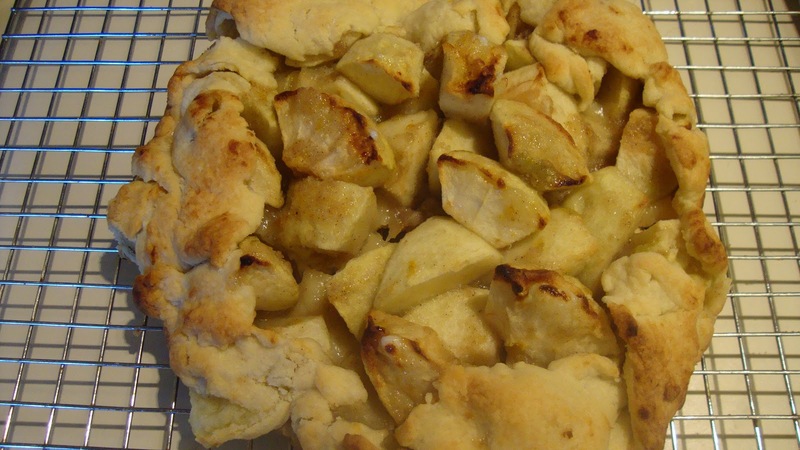 Carefully pour or spoon apple mixture into the crust. 5. 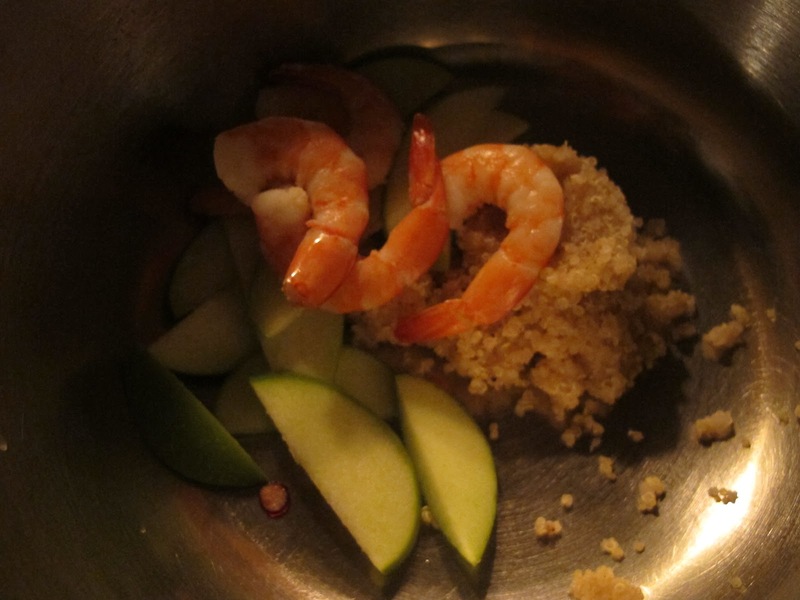 Drop the diced butter evenly over the apple mixture. 6. 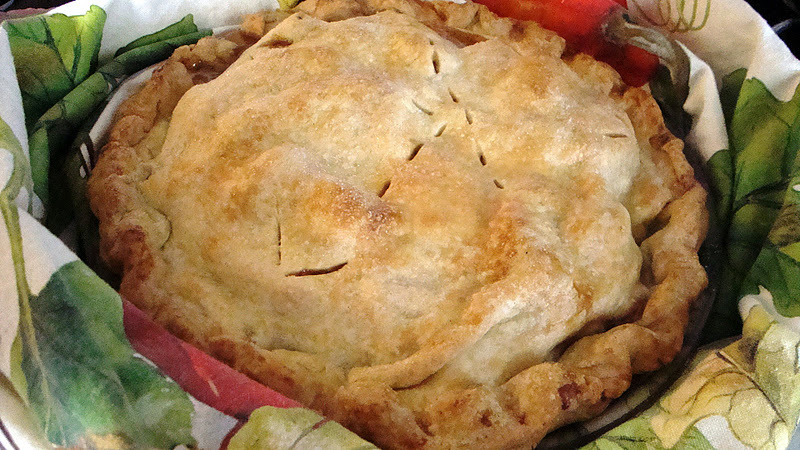 Place top crust over the pie and trim so that there’s about an inch overhanging the pie. 7. 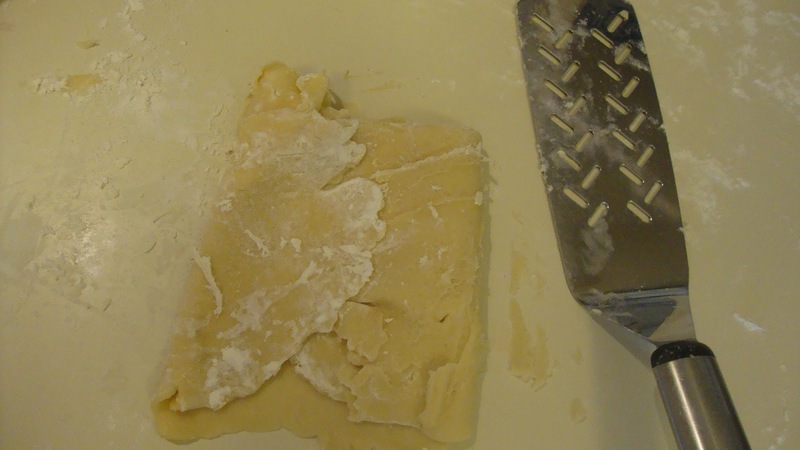 Pinch together the crust and either press edge of crust into the pie plate with the tines of a fork or crimp. 8. Using pastry brush, brush top crust with cream or milk and dust evenly with the last teaspoon of sugar. 10. Bake 15-20 minutes on a rimmed baking sheet lined with foil, and lower oven temperature to 350 degrees Fahrenheit. Bake another hour or so until pie is golden brown and juices are bubbling out of the slits. * Cool completely on a wire rack before serving. +Honeycrisp apples, developed at “The U” here in Minnesota, hold their shape well. Because of that, I slice them thinly. 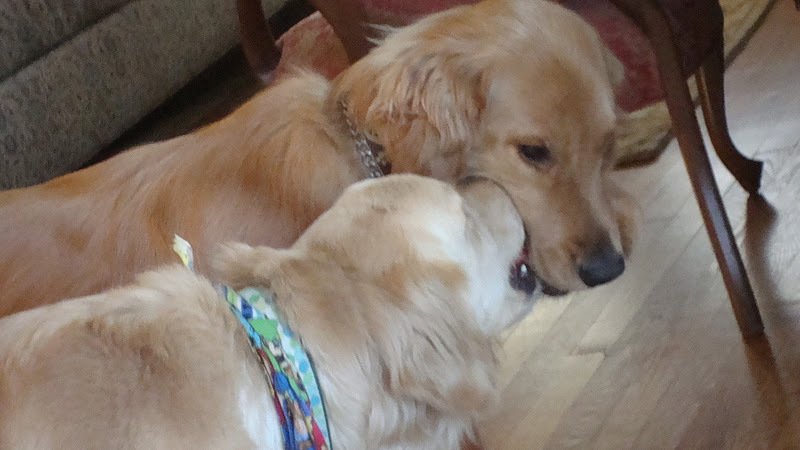 They won’t get terribly soft and break down. 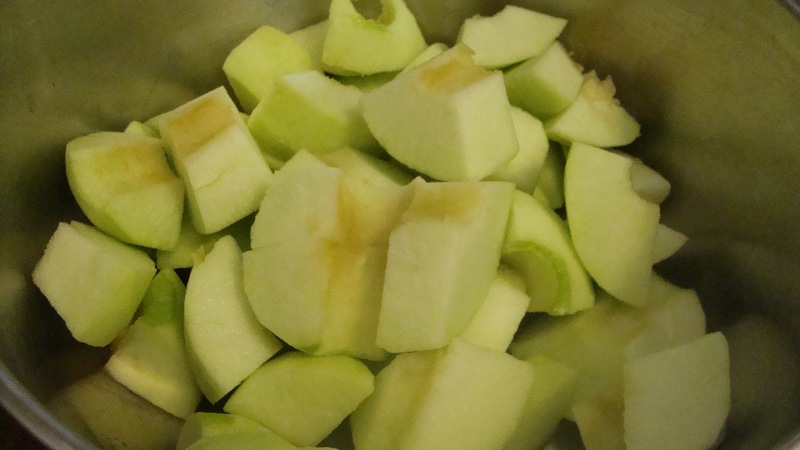 If you’re using a softer apple, cut them in larger slices. Also, some folks like the skin left on their apples for pie. Do as you like. *If it’s getting too brown, carefully lay a piece of aluminum foil loosely on top of the pie. Prep note: I usually prep the apple mixture and put that aside. Then I tackle making the crust. I roll out the bottom crust and place it in the pie pan. 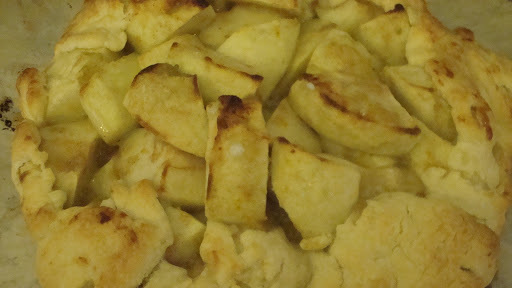 In goes the apple mixture and I set the whole thing aside while I take the second crust out of the frig and roll it. I next roll the second crust loosely around the rolling pin (or you can carefully fold it in half and then in half again) and gently lay it on top of the buttered apples. Trim, crimp, and it’s ready for the oven. Here’s the pie before baking. I had enough for a coffee cup pie for Dave. *In food processor, place flour, butter and salt. 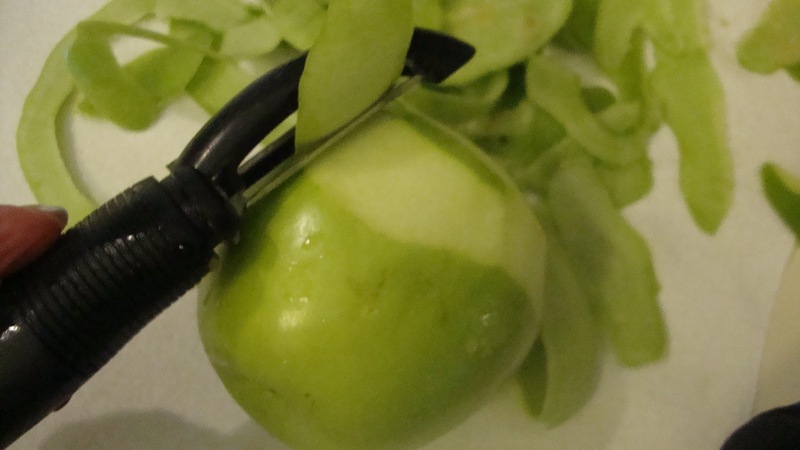 (This may also be done with a pastry cutter or two knives.) 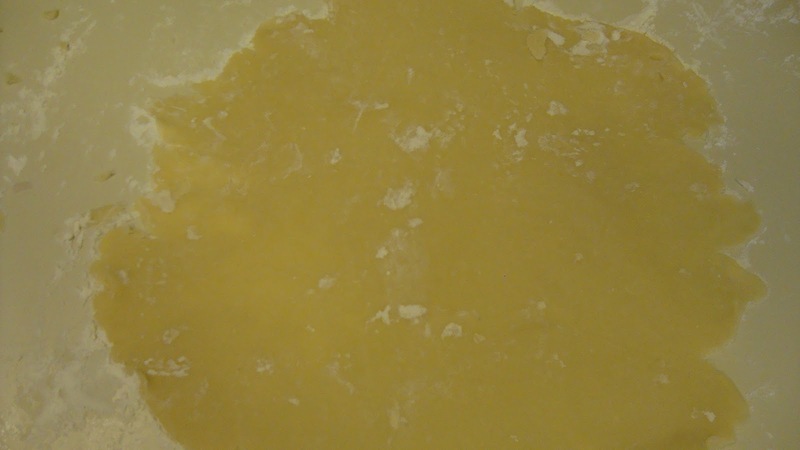 Pulsing, cut butter into the flour until there are 1/2″ sizes pieces (and some smaller and some larger) of buttered crumbs. *With machine running, pour in water slowly. 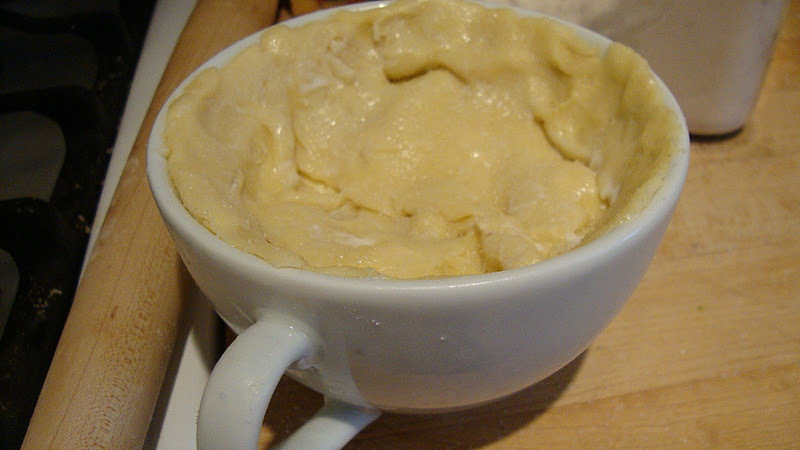 When the dough begins to pull away from the sides of the machine, stop the machine, and turn dough out onto a well-floured board or counter. *Gently and quickly pat dough into a ball and divide ball evenly in half. *Wrap one half and refrigerate it. Take the other half and press it into a flat disc. 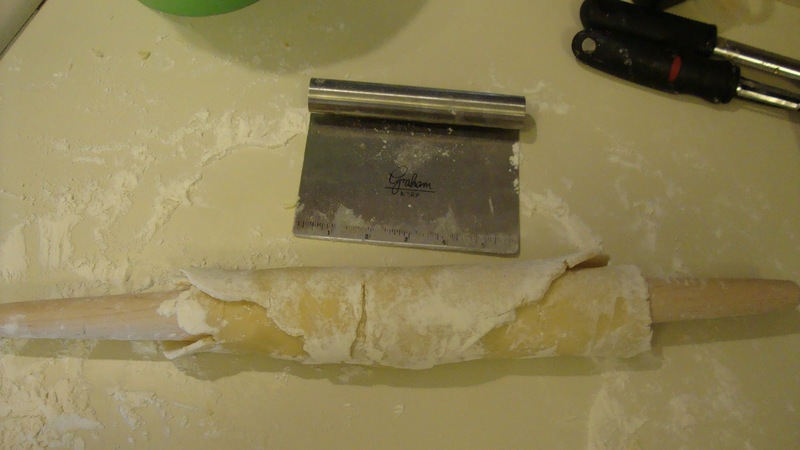 Dust the dough with flour, and, with a floured rolling pin, roll from the center out to the edges moving clockwise around the dough until the dough is about 10″ in diameter. Move the dough every few rolls of the pin so it doesn’t stick. You may need to keep putting a bit of flour sprinkled underneath. *Remove dough from frig and repeat for top crust. All baked up with somewhere to go. *The recipe for this dough is from an old CUISINART cookbook–one of those thin, small books that came with my first CUISINART in the early ’80s maybe… This was the first Pâte Brisée I ever used and I’ve been using it ever since. Thanks, Cuisinart! 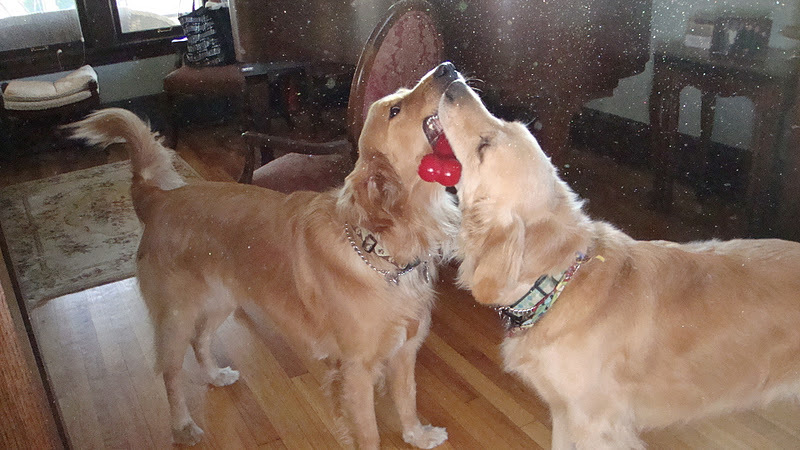 Two-Dog Kitchen and Around the Hood…..
Next Monday, November 21, I direct a pick-up choir at St. Frances Cabrini Church, 1500 Franklin Ave., Minneapolis, MN, for an Ecumenical Thanksgiving. Want to sing? 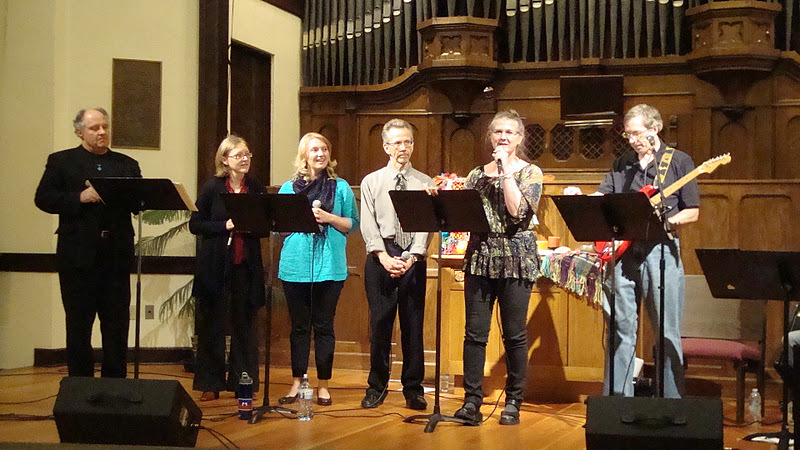 Show up at 6pm for rehearsal of easy anthem,”Simple Gifts” for worship service that begins at 7pm. Hope to hear you! 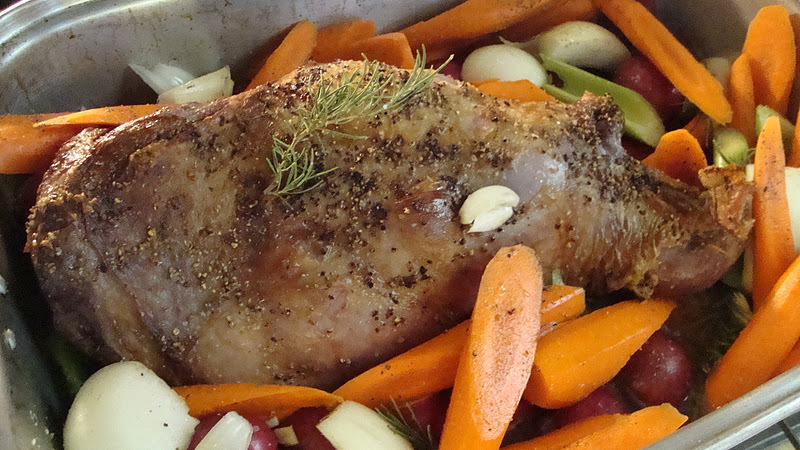 This is up on the blog next–a braised leg of lamb with vegetables. Perfect alternative Thankgiving. 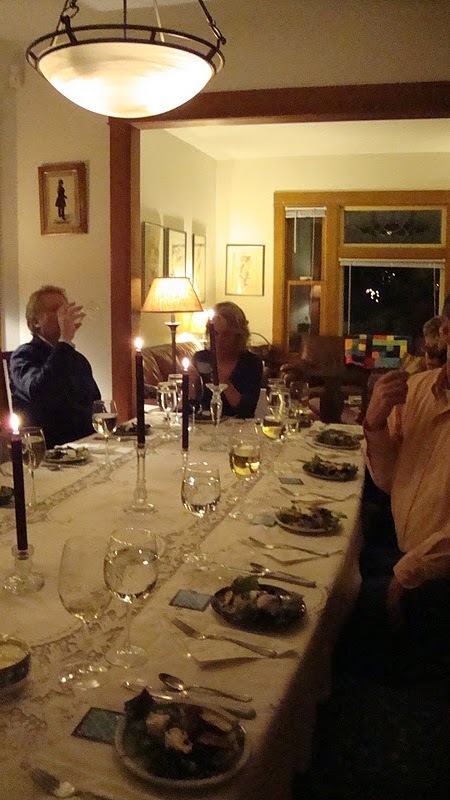 The start of a neighborhood birthday/wine-tasting dinner….I did the lamb above. It was potluck. 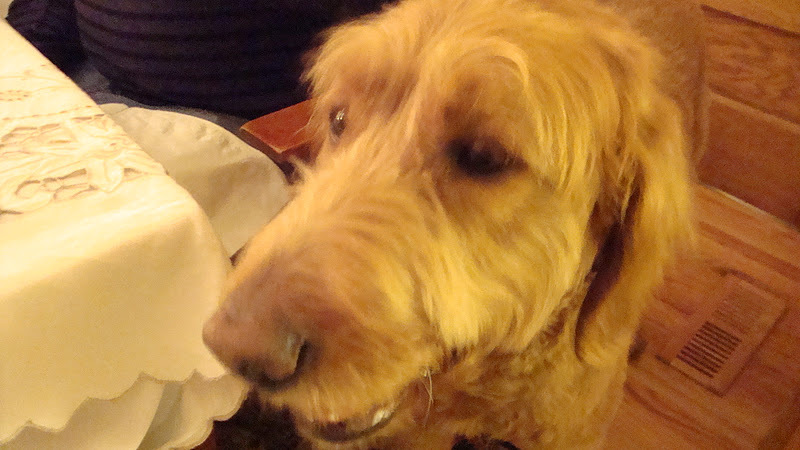 Friend Mac at the table Friday night. 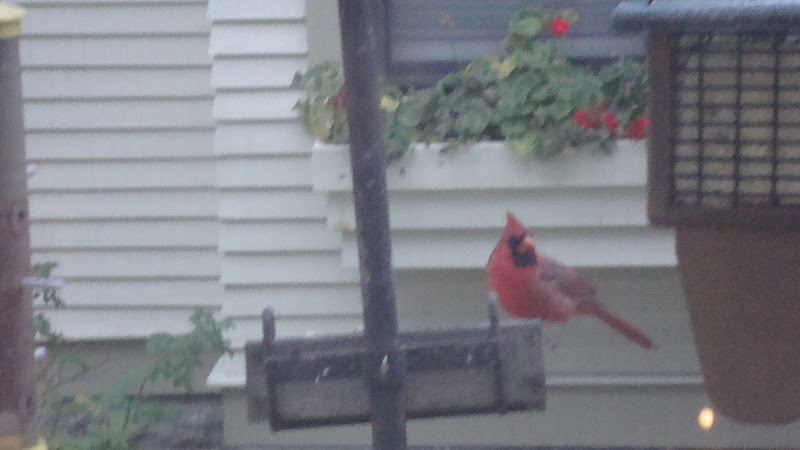 Today’s cardinal + flowering geraniums still living in neighbor’s window boxes! 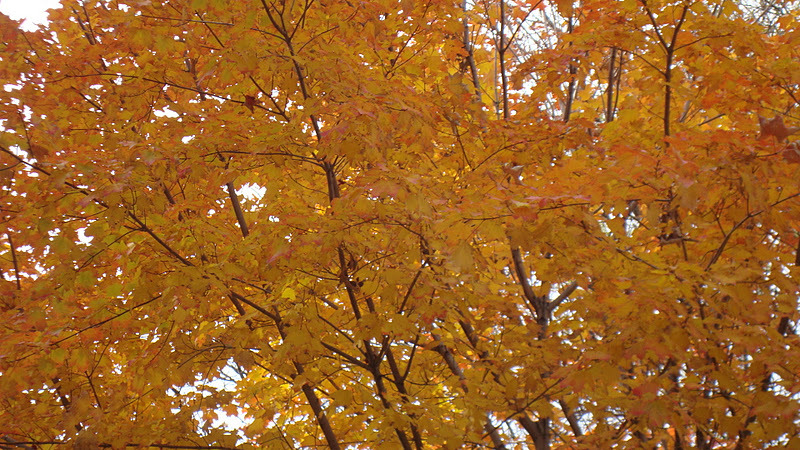 Gorgeous trees still golden ’til just a few days ago. We haven’t had any really cold weather yet and that’s unusual. 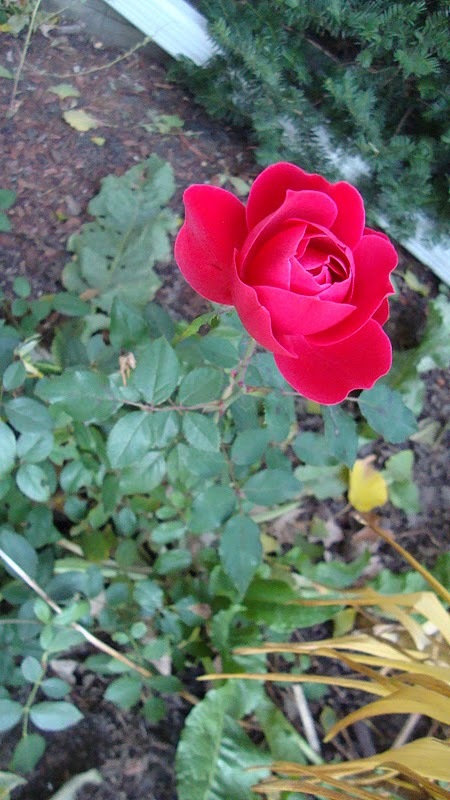 Several days ago, I finally cut the last of the roses and brought them in for a vase. 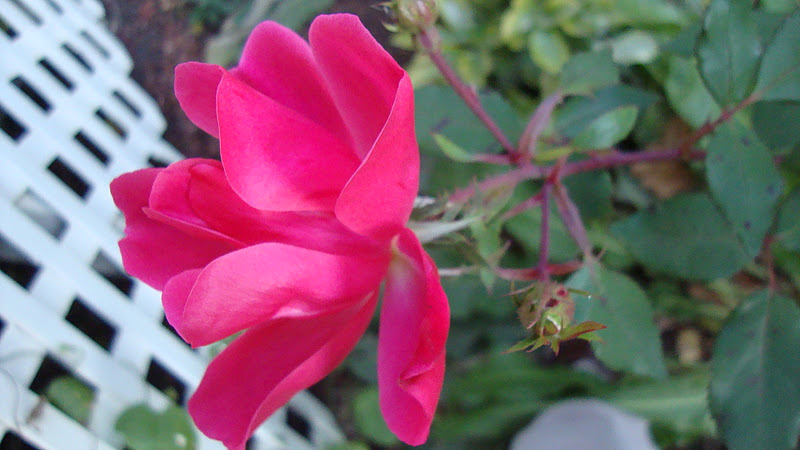 I rarely cut my flowers, thinking they look best where God placed them. But when it’s going to be 22 degrees F, I cut them all! 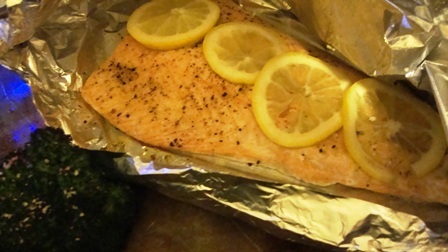 A foil packet salmon done in 20 minutes I wrote for Examiner.com. Dave said, “This is the best salmon I’ve ever tasted.” I couldn’t believe how tender it was.